I had always been somewhat dismissive of the Grand Floridian Resort & Spa at Walt Disney World, after all, it seemed to be just a copy “wannabe” of my hometown’s Hotel Del Coronado. It is THE priciest resort at Walt Disney World. Looking at the website, there's not much to distinguish it from the more moderately priced Yacht Club Resort (a tried and true favorite). Nor does it boast African safari animals right outside the window like Kidani Village (still my top pick). So what’s the big deal? 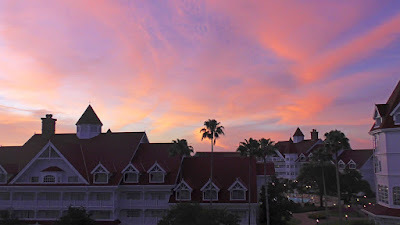 Well, during a recent hosted stay at the Grand Floridian, I discovered there is more to this place than meets the eye. True magic cannot be conveyed in a photograph, or a “luxury” rating. It has nothing to do with a classic façade, elegant staircase, grand piano, perfect cocktails, spacious pools or fine restaurants. At the Grand Floridian Resort, I discovered that small human gestures of service make a grand difference in experience, turning the ordinary into something magic. When I first encountered Richard, I almost missed him. Instead, I had noticed a little girl with a pouty face sitting on a bench outside the entrance to the Grand Floridian. There were no obvious parents in sight. As I approached, I watched her face begin to change, and within moments it lit up in an ear-to-ear grin trying not to burst out in giggles. I looked where she was looking. A smallish man wearing a straw hat was dancing a little soft shoe jig. As he turned my direction, I saw his face, and I was overcome with such warmth and joy that I couldn’t help smiling back. This charming man was Richard, and his 91-year-young face conveyed a lifetime of magic. Meet Richard, welcoming guests to Disney's Grand Floridian for 24 years, from the exact same spot. So nice to meet someone truly happy in his job. Always a smile. I took a selfie with Richard, and introduced him on my social media feeds so others arriving would feel as “welcome home” as I did. The comments poured in – he is known and loved far and wide, and those who’d never met him before, made a point of finding him. He’s as iconic as the hotel itself…but he holds the real magic. 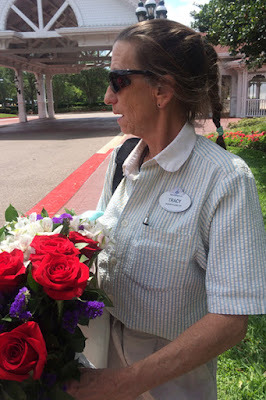 When I received a text alerting me that my room was ready at the Grand Floridian, I went to the Bell Captain’s desk to collect my held bag, at which point I was offered the assistance of a bellman to help with my case and show me to my room. As I followed him past the reception desk, I see a woman checking in as one of the Traveling Mom writers, so naturally, I stopped to meet and welcome her. She exclaimed, “oh, you’re the photographer!” and we excitedly talked cameras for a few minutes as my bellman stood back and waited patiently. As we proceeded through the lobby, I see more of my dear friends and colleagues arriving, so I stop for quick hellos and hugs, while my bellman stands by. I glance at him anxiously. “Take your time,” he assures me. One of my colleagues thanked me for the posting the “Meet Richard” photo. Then the bellman and I turned a corner and I hear my name. I look over to see even more colleagues and friends at a second check-in desk for our media group where I stop and collect my credentials. This takes some time, and I’m certain at this point my bellman is fed up and ready to disappear, leaving my rolling case to roll off into oblivion. But no, he stands by professionally and unobtrusively, one hand firmly on my case. And when I’m ready, he holds the door open and leads me to a waiting golf cart to transport me to my building. No sooner do we start rolling along the path when I hear “Kymri, is that you?” Without looking back, and already knowing me by name, my bellman-turned-chauffeur stops the cart, and waits as I catch up with yet another friend. “Look how fancy, you get your own cart!” she remarks. Yes, indeed, I felt like a celebrity with my exclusive cart limo and personal bellman-chauffeur. Certainly the paparazzi were lurking in the bushes, but he masterfully averted them. unpacked for me and plugged in all my devices. One might expect that housekeeping at Disney Resorts is performed by fairies sprinkling pixie dust. Or perhaps, Mary Poppins herself. Spoiler alert: Housekeepers at the Grand Floridian are real humans. They make beds, clean tubs, vacuum crumbs, freshen towels, and even leave chocolates on the pillows at turndown. And they do it all without the help of forest bluebirds and magical dancing brooms. But they make magic in other ways, which I experienced firsthand. I had just come back to my room after my daughter sent a text that our senior dog, Jambo, had stopped eating.She was home alone with the dogs, her dad still at work, and I texted back that I would call as soon as I got to my room….my freshly cleaned, cool, quiet room. I called using facetime, so I could see our dog and better judge his state. No sooner had my daughter answered the call then a knock came at my door. With phone in hand, I opened the door to Brenda, my housekeeper. She was checking to see if all was in order, and if I needed any more towels or anything. My daughter asked who I was talking to, so I held up the phone and introduced her to Brenda over facetime. While there was nothing I needed from Brenda, she smiled warmly at my daughter and reached into her cart. “I think you might need more of these… I’ll just give them to you now,” she said, handing me extra chocolates. Then she closed the door leaving us to our call. When I asked to see Jambo, my daughter exclaimed, “Look! He’s eating now!” And indeed he was. While I’d like to think it was the sound of my voice, I’m going to go with crediting Brenda. With all of our press events over and done, a group of us were making our way back to the Grand Floridian to catch the Magical Express to the airport. We were walking along the path, and a woman carrying a beautiful bouquet of roses was coming towards us. She skirts the path so we don’t have to step aside. As she passes, someone remarks “What beautiful flowers!” She turns around, and offers a rose to each of us. Naturally, we’re flattered and every one of us pulls a rose from the bouquet, leaving just two remaining. As we all thanked her, I asked if they were meant for a guestroom, figuring she’d just stop and get more. “No,” she replied, “I just got off work and am taking them to my husband. “ “A special occasion?”, asked another. Tracy replied, “Yes, I suppose it is. He just came home from the hospital today.” And before we could finish thanking her or even try to put the roses back in the bouquet meant for him, Tracy kept right on moving, wishing us all a magical day. And there you have it, four stories of Grand Floridian staff members making magic. Richard, if you are reading this, thank you. Because of you, I saw a pouty little girl smile…and believe me, I’ve been that pouty little girl more than I’d like to admit. So on behalf of this pouty little girl, and probably hundreds before and since, thank you. Your simple charm is nothing short of magic. Jerry, if you are reading this, or if you even truly exist by that name, thank you. I know you were introduced and wore your nametag. But it was your magical way of performing the same job you’ve done for 28 years that left an impression deeper than the letters etched on a badge. I’m still wondering if I just imagined that whole magical VIP escorted journey from Bell Desk to my room… was it magic? Or were you just doing your job? Either way, a flawless performance. Brenda, if you are reading this, thank you. My daughter thanks you for the chocolates, and I thank you for being kind. Your small gesture did not go unnoticed. You are proof that every human has the potential for making magic, knowingly or not. But do tell, where were you hiding your wings? 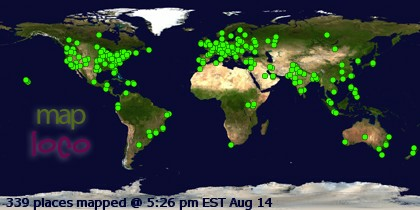 And finally, Tracy, if you are reading this, thank you. I hope your husband knows that for every red rose missing from that bouquet, one more woman was thinking of him and sending well wishes his way. Thank you for touching our lives in that brief moment and reminding us we’re all just humans, and we’re all capable of sharing little acts of magic in this journey of life. I was hosted by Disney at the Grand Floridian Resort & Spa, and my assignment was to review this luxury property with lots of pretty pictures. Clearly, that morphed into something entirely different. Had I done such a review, you’d never know the magic. Instead, your only takeaway might be the noisy drinking adults in the public areas all hours of the night, or the renovation work in progress in my building (6) which made for noisy and detoured ins and outs. And there were plumbing issues – a magical running toilet that failed to flush each night I came back to it. But here again, the seemingly ordinary human maintenance man was full of magic, too. He shared a wealth of knowledge about the hotel’s history and explained in detail the process of updating the “historic” fixtures - we’re talking PVC pipe diameters to/from toilets – yet somehow his enthusiasm had me envisioning scenes from “Fantasia.” He’d obviously been working there for years and clearly loved his job, too. It is evident at the Grand Floridian Resort that when you have contented employees serving guests, the results are magic. Now I understand why families buy into timeshares and return year after year to places like the Grand Floridian Resort. If you are so inclined to try a resort residence rental for your next family vacation, the good news is, you don't have to belong to the Disney Vacation Club to try one! Check out Vacatia.com, where you’ll find Villas at the Grand Floridian, Kidani Village, and several other vetted and owner-listed resort properties to select from. Wherever you choose to go, remember, real magic is an experience of exceptional service in simple gestures. If you’re not finding it, then start making it, just like Richard, Jerry, Brenda, and Tracy do, every day, at the Grand Floridian Resort & Spa.